Litter Bred by Linda Stewart, Angie Diehl and Dr. Dennis Sumara. Handsome young Kody finished quickly, taking Best Puppy at an American Whippet Club Specialty along the way. Earning many of his championship points from the Puppy Classes, Kody generated a buzz that reached both coasts in no time. His sire is one of the breed's renowned stallions: MSBIS Am Can Ch Red Cloud Quintessence ROMX, "Russell." His dam is the beautiful Ch Meisterhaus Goldie Hawnd. Kody was bred by Gail & Jenny Boyd (Ableaim), A. Tad Brooks (Meisterhaus) & Linda Johnson. 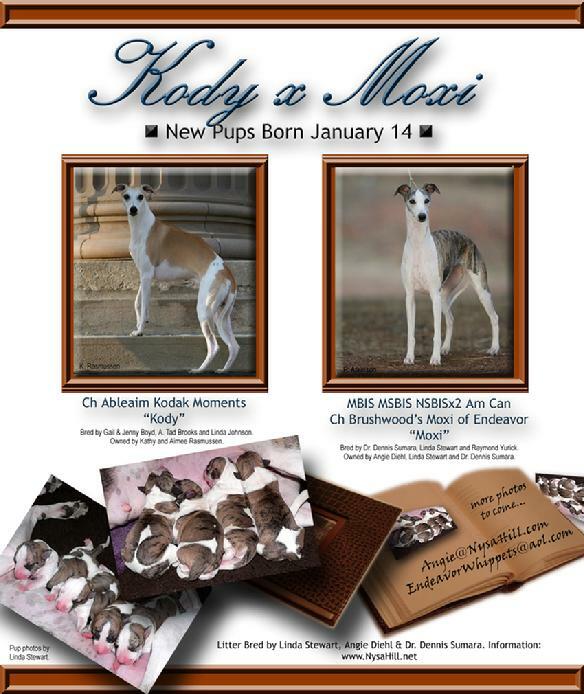 We are most grateful to Kody's owners Kathy & Aimee Rasmussen (Harmony Whippets) and Connor Black for making this breeding possible. 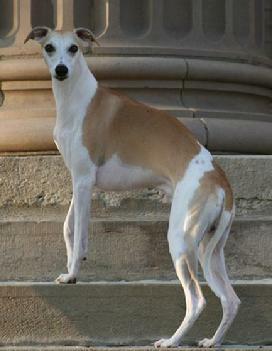 This litter's dam, our Moxi, was #1 Whippet in America for 2006 and 2007. 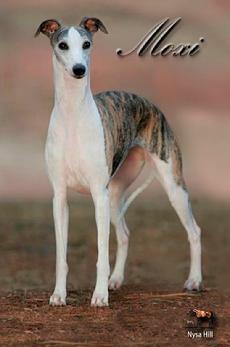 Winner of the American Whippet Club National Specialty three times (2004 from the classes, 2006 and 2011), she's taken 14 all-breed Bests in Shows in the US, won Best of Breed at the AKC Eukanuba National Championship and Westminster, and she's taken the top honors at an amazing 13 Whippet Specialty Bests in Show, and One Amercian Hound Specialty as well. 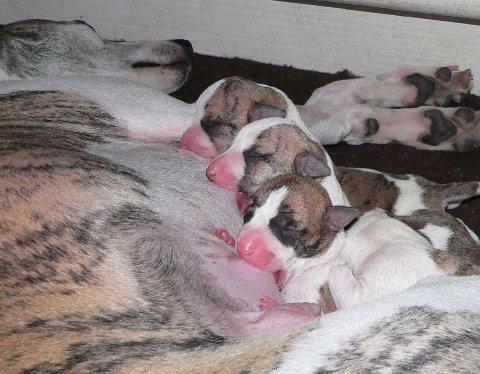 All four pups born on January 14, 2009 are healthy and happy -- two males and two females. We'll continue to post photos as this exciting new litter grows up. Nysa Hill Capricious Endeavor of Moxi - "Caprice"
Bred by Linda Stewart (Endeavor), Angie Diehl (Nysa Hill) and Dr. Dennis Sumara (Brushwood). Owned by Angie Diehl of Nysa Hill and Mandy Clevenger. "Caprice" - Nysa Hill Capricious Endeavor of Moxi. What a thrill, and yet what a dilemma, to have to choose puppies given four such lovely progeny. Every single one of the Kody x Moxi babies is "first pick" in one way or another. Both females are so beautiful, with such great expressions, such lovely shape and bodies. But the intensity and direct gaze of Caprice go right to my heart, and remind me exactly of that look Moxi gets when she really, really wants something. Nysa Hill Ocean Endeavor of Moxi - "Ocean"
"Ocean" at 4 months. Nysa Hill Ocean Endeavor of Moxi (Thanks friend Paul Lepiane for the beautiful stack). Hanging out seaside with co-breeder Linda Stewart (Endeavor), mentor Daniel Lockhart (Saxon Shore) and me, Ocean was hypnotized by the water, the surfers in their squeaky black wet suits and the crashing waves. Both he and pool-loving half-sister Epic adore our hydrotherapy grotto. He leaps onto the water net and clamors for splash play like a born seal, not a whippet. So, he got his pool safety sessions extra early -- to learn step locations, stairs and exits. Clearly, this boy loves the H2O. Ocean picked me, not the other way around, even though both males from this litter are simply stunning - exceeding every expectation. Co-breeder Linda Stewart says his call name should be "Dude. (or "Dooooood") since he's so perfectly easy-going and fun-loving. The ultimate California boy. Indeed, Ocean had to have a water-borne name. Sweet and playful, biddable and eager to please, he has no idea (yet) that he's such a striking exemplification of his sire and dam, and their legacy's future. Moxi's newest litter nuzzles mom with vigor. 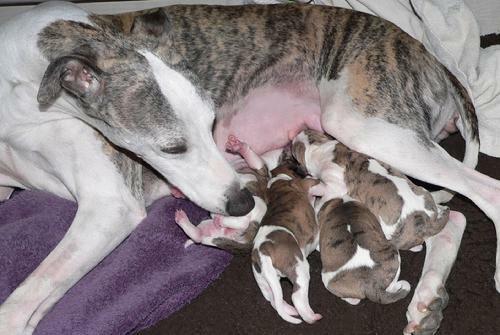 The two boys and two girls were born happy and hearty, at between 13-14 oz each. Photo by Linda Stewart/Endeavor. The Kody x Moxi puppies enjoy one of their first meals. Photo by Linda Stewart. Sire: Ch Ableaim Kodak Moments "Kody" Photo by Kathy Rasmussen. Dam: MBIS MSBIS NSBISx2 Am Can Ch Brushwood's Moxi of Endeavor, "Moxi." Photo by Peter Atkinson. Above: Kody Takes Winners Dog at a Specialty from the Puppy Classes under Judge Thomas Kirstein. Shown by co-owner Aimee Rasmussen. Above: Moxi wins her 3rd of 14 US Bests in Shows to date under Judge Pat Trotter.